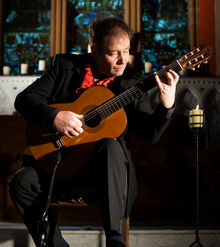 Pat released his album Cayendo in 2010 which has been described as an incredible collection of original and iconic classical guitar compositions performed by a true master. "this album is a collection of music portraying the many colours and passion that the classical guitar has to offer. This album will make you smile and make you cry but at the end the listener will be left fullfiled with the power and passion of the music. Mr Coldrick has the innately musical gift of knowing how to heighten a musical phrase by unexpectedly transforming it. He brings freshness and imediacy to what he plays. His interpretations are striking and highly individual and definetly a guitarist with a unique and refreshing style." Through his interpretation of music and by exploring and embracing new technologies he strives to enhance the dynamics of the classical guitar and bring his music to a wider audience. His music defies genre and appeals to a wide cross section of music lovers. While Pat plays his own arrangements of great classical pieces, it is his own compositions that sets him apart – pieces such as Lament, CityJam and Antartctica to name but a few. Pat’s skillful and atmospheric connection with his audience is an art form in itself and is in total contrast to other more formal classical performances. He has a very easy going, laid back and unassuming approach and his interaction with the audience and philosophy of ‘entertaining’ rather than ‘educating’ his listeners is a breath of fresh air. Once Pat begins to play people are immediately captivated by his dedication, passion and skill. His interpretation and delivery of each piece combined with his superb artistry as a performer results in his unique ability to make his audience laugh and equally move them to tears.